Ready Player One follows Wade, aka Parzival, around in both the real and virtual world. It takes place in the near future; 2044. The author, Ernest Cline, uses a literary tool that can draw in several readers who otherwise would not be inclined to pick up a science-fiction book. The main story line is developed around one character's obsession with 80's and 90's music and movies. The story is good by itself, but it was heightened as I experienced the full impact of nostalgia from almost every reference. It is always fun when science-fiction selects a time that is within a generation away. This way, the world has to resemble present reality, but the author has the free range to deviate for technologies that may soon get developed. And as today's technology is continually surprising people with its progress, much is likely to change by 2044. The technology Ernest Cline uses to enhance his world is augmented reality (AR). He describes all the equipment that alter each sense to take the user from a bleak life in reality to one, or several, more fulfilling lives, in a virtual space. Earlier movies such as The Lawnmower Man attempted to use the idea of AR for scary effect. Because it is new and foreign to people it easily lends itself to making people feel uneasy. And while the applications Ernest shows may make people feel uneasy, he depicts real world uses that overall make the world a better place to live (as long as the company is controlled by a worthy individual). New technology tends to make people uneasy. However, as it slips into existence people get used to it, and it becomes common place. There was no place for an iPad until Apple created the market. How much time is currently spent playing video games. That question includes Farmville, or whatever other new game has come along. First AR will be used for video games. It is the most natural progression. Then, multi-player role playing games. Then, massively multi-player role playing games (MMRPG). As the video games find massive audiences, Facebook and Google will upgrade their Face Time and Hangouts (interfaces that allow people to interact with each other with video), respectively into new social networking virtual experiences. Gaming Consoles have Explored Different Interfaces. Now Nintendo is Edging into the Social Network platform. Not Much of a Leap to Create a New AR Interface and then you could Control your Already Customized Avatar. The virtual realities may start out as simple block like environments such as Mine Craft, but they will eventually evolve to be as real as any user wants. Eventually go to Hell and back in a marathon session of the latest all too realistic Diablo. People and the environments they interact in will seem to evolve in a flurry of activity. Why go visit family when you can plug in and have the same connection without having to drive? Why go to a friend's house to watch a movie when you can plug in? Eventually, as more and more memes get sucked into the AR sphere businesses will begin to take advantage of the cost savings and added customer communication. 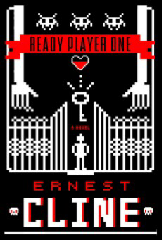 Cline point out those advantages as he subjects Wade to the abuses of being a help desk rep.
That is all the progression needed to turn the majority of Ernest Cline's Ready Player One from science-fiction to fiction. Part of my interest is that he explores the potential reinvention of a couple long standing institutions; education and prison systems. The next posts in this series will discuss his vision and how society might get to a point of implementing some version of it.